The Retina display on Apple's newest 7.9-inch iPad mini shows a smaller range of colors than the high-resolution screen found on the larger iPad Air and other competing tablets, according to one analysis. In contrast to the unit's otherwise impressive gains in resolution and performance, Apple has chosen to equip the new iPad mini with a display that features the same narrow color gamut as its non-Retina predecessor, as noted by Anandtech. The tablet was bested by Apple's fourth-generation iPad and new iPad Air, as well as Google's Nexus 7 and Nvidia's Tegra Note 7 in testing. Measuring color gamut means, broadly, measuring the subset of colors a display can reproduce within a larger, predefined range. The iPads were subjected to tests that measured their ability to reproduce colors within the sRGB color space, an industry standard range of around 1 million colors designed to be used with computers. 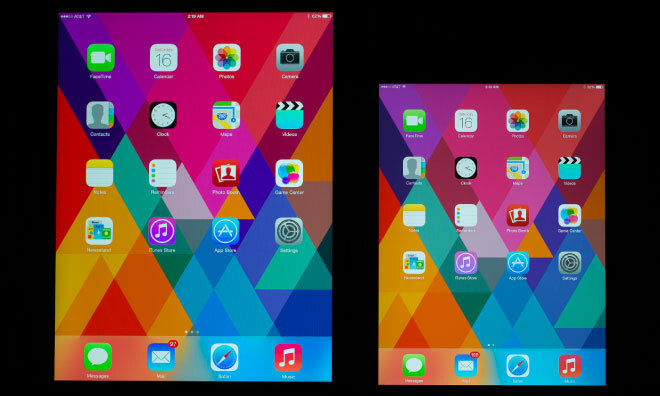 The difference is most apparent in red, blue, and magenta colors on Apple's new Retina iPad mini. Differences in color reproduction are quantified with a measurement called Delta-E, which represents the difference between the color the display is asked to reproduce and the color the display actually shows. The Retina iPad mini managed an average Delta-E of 6.5 across the gamut, compared to 2.4 for the iPad Air and 3.3 for the Nexus 7. Delta-E values of approximately 2.0 or lower are considered unnoticeable to the human eye, while professionals who require display color accuracy— like photographers and video editors— aim for Delta-E values of 4.0 or lower on their workstation displays. Anandtech speculates that Apple believes consumers for whom color accuracy is a concern will choose the iPad Air over the smaller tablet by default, rendering the new iPad mini's marginally narrower color gamut— a difference which the publication calls "small but apparent"— a nonissue.